Laura K. asks: Why does the yolk of a hard-boiled egg sometimes turn green? The process of hard-boiling an egg involves denaturation. During this process, the amino acid chains found in the proteins in the egg are altered from their original, raw egg state, with the denaturation temperature varying somewhat depending on the specific protein in question (see chart here). But in a nutshell, adding heat to these proteins initially causes the proteins to partially unfold or otherwise change their normal organized spatial structure. As this is happening, the proteins begin to aggregate and coagulate together. As heat continues to be applied, additional bonds are formed in these clusters, creating a relatively dense protein network, which in turn results in the rubbery egg whites and solidified yolk you find in hard-boiled eggs. As to why if heat is applied long enough, you’ll get a greenish colorization around the yolk, to begin with, the proteins in the egg white contain sulfur. That sulfur combines with hydrogen during the denaturation process and produces hydrogen sulfide, a toxic gas that produces an unmistakable “rotten egg” smell. Due to being heavier than oxygen and nitrogen, which make up the vast majority of Earth’s atmosphere, hydrogen sulfide can normally be found collecting in spaces like wells and caves, and it is not only poisonous but also flammable, corrosive, and explosive. Fortunately for egg lovers the world over, the amount of hydrogen sulfide released in the egg is so small that it does not pose any health risk whatsoever. When you cook an egg, heat is (obviously) applied from the outside and works its way in. This is important to the topic at hand because the solubility of the egg white decreases as it heats up, forcing the hydrogen sulfide inwards, towards the yolk. Also notable to the topic at hand is the fact that egg yolk contains iron, which is ultimately set free from the phosvitin in the yolk via heating the yolk sufficiently. When these iron cations come in contact with the hydrogen sulfide around the area where the yolk meets the egg white, a resulting chemical reaction produces iron sulfide. 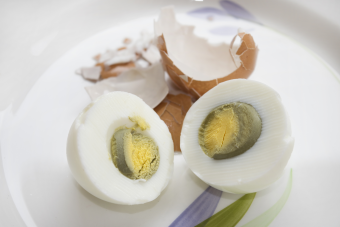 Iron sulfide has a greenish, gray coloring, hence the green/gray tinge around the yolk of a hard-boiled egg. The longer you cook the egg, the more iron sulfide is produced and the more discoloration you’ll see in the yolk. You will also see a similar discoloration happen when cooking eggs in an iron skillet for the same reason. Likewise, if you find that you still get this greenish yolk ring in a hard-boiled egg even when not overcooking it, it is likely the case that the water you’re boiling the egg in has a relatively high amount of iron in it, resulting in iron sulfide being produced more rapidly than you might otherwise see. And if you’re wondering, aside from not being terribly aesthetically pleasing, it is perfectly safe to eat this green part of the yolk. Why Do Americans Refrigerate Their Eggs and Most Other Countries Don’t? Why is Mustard Yellow When the Seeds Used to Make It are Not? Adding salt or vinegar to the water you boil eggs in will speed up the denaturing process within the egg. Why is this helpful in hard-boiling eggs? If the egg’s shell cracks, you might notice some of the egg escaping before it has time to harden. The vinegar or salt helps reduce the chances of such leakage. Why Do Hard-Boiled Eggs Turn Green? Are Green Eggs and Ham Safe to Eat? Do You Know How to Hard Cook an Egg? Hot tip I learned from a chef: If you carefully puncture one end of the egg with a pin or thumbtack before boiling, the hydrogen sulfide and other gasses will escape as bubbles, leaving the yolk a bright yellow. How not to overcook: first, don’t let it unattended while “fire” is on… now, put the eggs in a pan and water until it covers the eggs. Bring the water to a boil on the medium setting. When the water starts to boil, turn the heat off and let them there for 10 minutes. Perfect yellow eggs every time.